Nottinghamshire PCC Paddy Tipping has written to the government asking ministers to support Finn's Law, which would give police dogs and horses the same status as injured officers. Currently attackers are prosecuted under rules for causing criminal damage. Police dog Quantum suffered stab wounds on 15 March in Nottingham. He had nine stitches and will need specialist training before he is able to return to duty. Three officers also sustained knife injuries in the same attack in Ridgeway, Top Valley. They have now been discharged from hospital. The Service Animals (Offences) Bill, which aims to broaden sentencing powers when a service animal is injured, is currently making its way through Parliament. Following Quantum's stabbing, Mr Tipping has written to Home Secretary Amber Rudd. 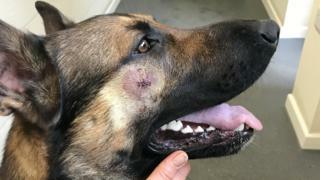 It was launched after the stabbing of a police dog named Finn, who was chasing a suspect in Hertfordshire in October 2016. His handler, PC Dave Wardell, was also injured. Finn and PC Wardell survived and returned to work 11 weeks later. The campaign has gained public support, with more than 120,000 people signing a petition to give status to police dogs and horses as officers. No current laws specifically protect police dogs or horses. The Animal Welfare Act 2006 makes it an offence to cause any animal unnecessary suffering while the Criminal Damage Act 1971 classes animals as property capable of being "damaged and destroyed". However, campaigners say police dogs and other service animals shouldn't be regarded as "objects" or "property" and call for a new law which recognises their individual contribution to public safety. In his letter, Mr Tipping said police dogs are highly trained crime-fighters and ensure dangerous people are prevented from harming others. "There must be a change in the law to offer greater protection to our police dogs and to recognise the exceptional contribution they make to community safety," he said.